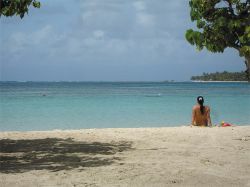 This photo tells you everything you need to know about Guadeloupe! With white sandy beaches surrounded by palm trees, clear blue skies and warm turquoise sea – a true island paradise awaits! During my visit, I loved speaking French with the friendly locals, eating great Caribbean food and working on my sun tan! 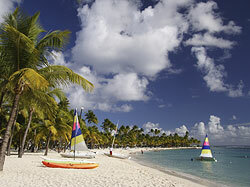 Become a Pirate of the Caribbean in Guadeloupe! The first thing that hit me when I went to Guadeloupe was the heat! Stepping off the plane, and walking down the tunnel to the terminal my first thought was that someone had left the heating on. Then I saw that the windows were open and realised that this was how it was going to be for the duration of my stay and I had better get used to it! To be honest, after a couple of days I did start to get used to it and it wasn’t a problem at all (in fact, it made a pleasant change to life in the cold and grey UK!). My bedroom had a fan to keep me cool at night, there is always the possibility of swimming in the clear blue sea. What’s more, the numerous bars along the beach mean that there is no shortage of ice cold drinks.